Ivy Press brand themselves as makers of beautiful books and The Book of Frogs is a fine example of this. These pictorial books (which we have informally dubbed The Book of… Series) have so far covered fungi, eggs, beetles, leaves, and now frogs (note: if you live on the other side of the Atlantic pond you might have noticed that Chicago University Press has the rights for the US). 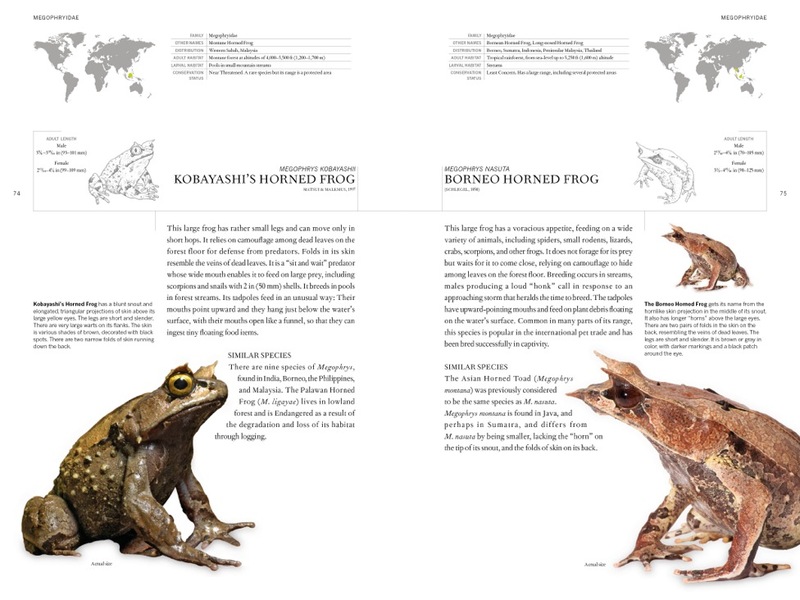 Like the other books, The Book of Frogs is a hefty tome, weighing in at 2.3 kg, and portrays 600 representative species from across the Anuran family tree. It includes common and endangered species, and even some which sadly have since gone extinct. 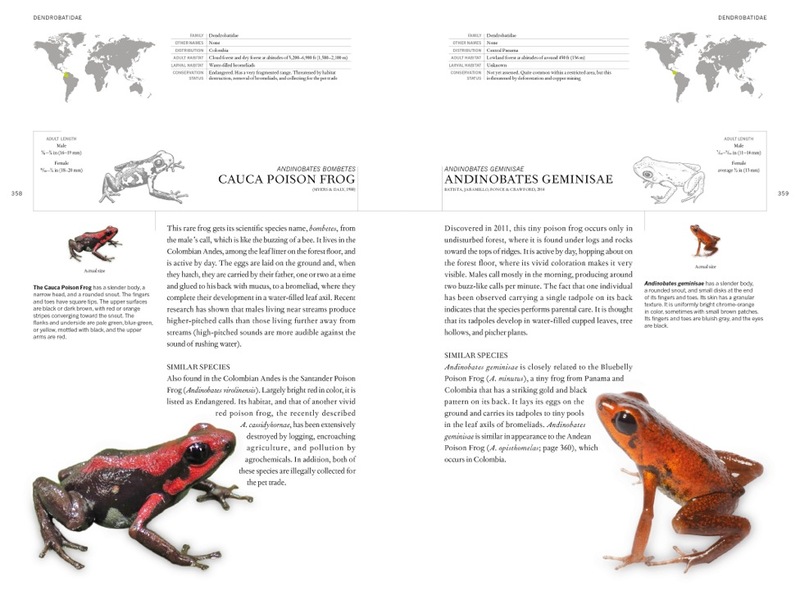 A short, 30-page section introduces the reader to the basics of frog biology, including their life cycle, calls, population trends and threats, diseases, and taxonomy. The text is aimed at a broad audience with little or no prior knowledge. Terminology is explained, and a 4-page glossary is included in the back (although does anyone really need to have things like “armpit” and “groin” defined for them?). The text is free from footnotes, and is not referenced, although a very short section with recommended reading is included; and there was the occasional factoid that aroused my curiosity (e.g. the specific frequency range of frog’s hearing means females are effectively deaf to males of other species) and made me want to look at the underlying literature – but it’s no great loss. The meat of the book is the 600 brilliantly illustrated pages that follow, each profiling a species. The same layout is followed throughout the book with the top third displaying some technical data: species name; adult size range; a table with family, synonymy, distribution, adult and larval habitat, and conservation status; a world map illustrating distribution; and a line drawing. The bottom two-thirds of the page contains a caption and two paragraphs of text giving a morphological description, some particulars on behaviour, reproduction etc., and a description of similar species. The real highlight is of course the photo content. A huge number of individuals and organizations have been approached to source high-quality images, which have been painstakingly cut out of their background. Most photos are duplicated, one life-size, the other blown up or scaled down. They highlight the diverse and sometimes bizarre appearance of frogs. Look out for the large-mouthed Surinam Horned Frog, the spectacularly coloured poison frogs in the family Dendrobatidae, or the barely frog-like Purple Frog. The book is a delight to flip through. Obviously, this book is not intended as a field guide or identification guide. Neither is it in-depth enough to be considered a fauna or encyclopedia, nor an iconography such as coleopterists and conchologists understand this term, although it does remind one of this to some extent. Given its global coverage, you can of course only give a selective cross-section in 600 pages. But calling it a mere coffee table book would not do justice to the carefully curated text. To my mind this book is squarely aimed at the armchair naturalist and those who love beautiful books, as the books in this series are eminently collectible. They make perfect gifts too. Ivy Press has hit on a very successful formula here and I’m curious to see what will be next (butterflies, feathers, shells?). There are plenty of other small and colourful things to be found in the natural world that could be pictured in this format. 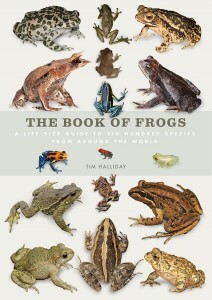 The Book of Frogs is available to order from NHBS. I bought this book from NHBS recently and agree broadly with the above review. This is a beautiful book about frogs and that was the reason I bought it. There are two shortcomings worth drawing attention to however. Firstly, it took me some time to figure out how the species are arranged. There is no introduction to the arrangement of species. There is a phylogenetic tree on page 35 and looking at that, I realised the species are arranged by family. Logical but explanation of this point for the layman would have been useful. My other presentational criticism are the distribution maps which are too small and the colours used to depict species’ ranges are too faint.